The most usual term is silver cord or astral cord. We prefer the term silver cord, because it obviously is an etheric phenomenon and every term which contains the word "astral" leads to misunderstanding. When separating our subtle body from the physical body, especially for beginners it’s mostly not easy to go out of the physical. We often find ourselves being hold back by a kind of tough, rubber-like mass and we have to make a greater effort. Even if the rubber-like mass can be overcome, a cord will remain that ties the fluidal body to the physical body. This cord is called the silver cord. The maximum distance from the etheric body to the physical body can vary between a few meters up to more than 50 meters, possibly depending on the energetic state (amount of energy and auric state resp. vibe). "The silver cord is not a physical feature. lt was likened by Bertrand to ‘a kind of elastic string’, by Muldoon to ‘an elasticlike cable’, by Turvey to ‘a spider's cord’ which was ‘silver’ and which ‘extends and contracts as an elastic cord’, by Gerhardi to ‘a coil of light’, ‘a lighted cord’, ‘a thin ray of light’ and ‘the silver cord’ (which he observed was behind his Astral Body as he moved forward [comment by the HP’s authors: here there is no difference made between astral and etheric body, which is why the silver cord is mentioned in the same breath with the astral body here]). Home likened his to ‘a silvery-like light’, Huntley described ‘a feeble thread’, Miss ‘P.L.’ ‘a cord’, Mrs Larsen ‘a current of mysterious influence’, Sigrid Kaeyer ‘a connexion’. Rebell described ‘a thin luminous ribbon’, Mrs Boorman ‘a stream of light’, Wirt ‘a silver cord or chain’, Mrs. Gilbert ‘a cloudy-looking cord’, the Tibetans ‘a strand or cord’, Mrs Cripps ‘a shaft of sunlight’, Stuart-Young ‘a thread’, the Anon. lady ‘a beam of light’, Mrs ‘T.D.’ ‘a smoky string’, Mrs ‘Prothero’ ‘a slender, slightly luminous cord’, Dr Simons ‘an elastic force’, etc. These people who independently gave such similar descriptions of what they saw include Britons, Americans, Frenchmen, Tibetans, Latvians, etc., clergymen, doctors, authors, musicians, etc. Many of them had never heard of the Astral Body or of astral projection." Where the silver cord goes into the physical and fluidal body, it broadens conically. Its colour is described as white or silver. It seems that the fluidal matter itself can sometimes be experienced as being of a silvery colour. The following experience was made in a state of higher auric vibe, so it is likely to interpret the silvery colour as a sign that the etheric body was in a lighter and refined form here. "I will add another experience of witnessing the silver cord. You may use this data as an excerpt or in whatever way you see fit. THE HOUT CASE NO. 2, in which the doctor tells of seeing the exteriorized etheric bodies of three different persons, while the latter were undergoing surgical operations. "In each case I was able to see, at least part of the time, the astral cord that united these spirit bodies with their physical counterparts. This was represented to me as a silvery shaft of light which wound around through the room in much the same way as a curl of smoke will drift indifferently in still atmosphere. When the magnetic force would draw the spirit close to the physical body, this cord was more apparent, as though more concentrated. At other times this force was indistinguishable to me …"
"While I was moving away from the physical body, the silver cord was connected to the backside of the subtle body. Turning around, face to the physical body, the basis of the silver cord was sensed at the frontside. It seems that the root of the silver cord always is directed towards the physical body. The most frequently described locations of the root of the cord are back and chest respectively and back of the head and forehead respectively. The position is affected by the focus of consciousness – being either focused on the body or mentally focused. The heavenly body leaving through the fontanelle (Indian/ buddhist technique of Pho-Wa). It is supposed that in this case the silver cord is connected to the fontanelle. "In a next step, I tried to shift the rotational axis from the back of the head to the lumbar region, which succeeded without any problems and now the fluidal body rotated around the central axis." Concerning the length of the silver cord, very different observations are reported. There seem to be great individual variabilities. Diameter and length are correlated. The "cord" is described as relatively short and thick when the "double" is within a few feet of the body and getting thinnner and thinner as they separate, until it is like a spider's web. This cord, which is always very thick at the beginning of the separation, is reduced to the thickness of a little finger later. But in some persons it stays considerably thicker, especially at the point where it is attached to. In this respect, I have no personal experiences. In literature (see Crookall) pulsations and vibrations of the silver cord are mentioned. Mostly, these pulsations are interpreted as transport of vitality and life impulses towards the physical body for breathing and heart beat. I prefer another interpretation: Pulsations and vibrations are very common experiences before starting body separation. Why should such pulsations not extend and spread over the silver cord? I think there is no need to attach importance to this detail. The etheric substance penetrating the physical body has been experienced (by occultists) as connected to vitality. A lack of etheric substance in human body is postulated to cause weakness or sickness. On the other hand, an accumulation of this substance – induced by a number of exercises in Yoga, Taoism, Kung Fu etc. – seems to lead to mediumistic and paraphysical abilities. While OBEing (etheric OBEs), a part of the vital body separates, forming a fog-like double: the etheric body. To prevent a permanent loss of etheric substance which is bound to the double, there seems to be a preservation mechanism in which the silver cord takes part, connecting the dissociated etheric matter to its source in the physical body. Thus, a separation of etheric matter with no return is prevented. Robert Monroe gives detailed descriptions of the silver cord in "Journeys out of the body" (various editions). "Then I suddendly felt that I floated above myself, maybe at about 10 – 20 cm height. But at the same time I felt a pull between my physical and my ‘astral’ head, which was equally strong. I got the impression of white, elastic, flat rubber bands which broadened. It was uncomfortable. The pressure developed into a dull ‘knocking’ and the bands were tightly stretched." In literature, the terms "silver cord" and "astral cord" are used without making any difference. I have split the two terms into two different meanings, assigning silver cord as a term for the etheric cord phenomenon and astral cord as a term for the astral cord phenomenon. The Theosophs initiated modern esoteric insights and their theories are accepted in most esoteric groups. Regarding this valuable research, criticism seems pretentious, but it nevertheless may be useful if we don't want to stick to dogmata. At the end of the 19th century, the most important impulse for civilization was the invention of a new way to send informations in ‘no time’ by means of electrical signals conducted in cables. It was logical to refer to the new development when creating a modern esoteric science, especially since cable-like features were found connecting subtle body to physical body. The social-religious paradigm of this era was hierarchical. In the same way as god was controlling world, the overself was controlling the physical body, passing on its orders to the latter by means of the information cable ‘astral cord’. Control was thought to be complete, even in details like breathing and heart-beat. Ideas like auto-organisation and self-regulation were not considered. A second and additional idea was the association of the cord with the umbilical cord, the motherly aspect being associated with the physical body, the embryo to the subtle body. Birth was linked to death: in birth, the umbilical cord is cut and the newborn enters daylight as individual; in physical death, the silver cord breaks and the soul is set free. Resulting from this philosophy, a break of the silver (astral) cord was thought to cause death. So far we have never seen, felt or touched a cord in the astral plane. For several times I turned in direction to the physical body to check the existence of a cord by touch and sight and had no positive cord observations. In all these experiences, there were no mediumistic signs and no threads registered and stepping out was easy and without problems. I very often turned around in astral travelling, mostly to gain better orientation. I have never seen a cord and I have never felt a direction in which the physical body could have been. I rather felt to be in another plane. In this case, the cord would have had to cross planes. I doubt if this is principally possible for any matter, even if it is a subtle matter – considering that every plane has its own kind of "matter" and organization. Can you expand on the theory that if the strand is broken the owner dies? What form would the strand take in it's connection with the owner (hanging from it, sat on top indian-rope-trick style etc)? It mostly is observed as hanging down, being of silvery shine or nearly transparent. If not hanging down, it always takes the shortest way to the physical body. Is the silver cord existing on the astral plane as well? In all observations and letters, the silver cord (the strand) is only observed in proximity to the physical body, thus, it is an etheric phenomenon and no astral subject. 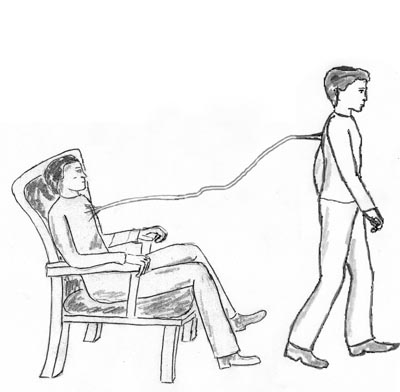 In contrary to these wide spread observations, theosophs have the opinion that the silver cord does exist as well on astral plane, as a cable for transport of mental/ emotional information and for vitality. This belief (that the cord exists as well on astral plane) is rather based on theoretic considerations than on observations. The theosophs are the founders of the present basis of occult/ transcendental understanding. Does the strand also apply to those people who are merely sleeping or only to those projecting? It's an observation of those who leave the physical body willfully by means of stepping out, floating out or rolling out. The silver cord is not observed in astral projections, which mostly are happening spontaneously or are performed by visual projections and are different from the above mentioned ‘leaving the physical body’ experiences. In Taoism, it is sought to achieve the development of a light body through ‘circulation of light’. 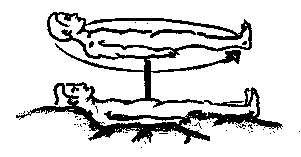 In most depictions of this light body, a strand can be seen which connects the light body to the vertex of the meditating person. 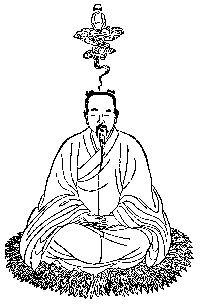 Strictly speaking, it is the fontanelle through which the subtle body leaves the material body in Taoism (Pho-Wa techniques). From: "Geheimnis der Goldenen Blüte", by Richard Wilhelm, with commentation from C.G. Jung, page 129 (german edition). Text: meditation 3. phase – separation of the spiritual body from the physical body, as an independent body existence. According to Indian mythology, the god of death Yama has a rope with which he binds the deceased and leads them to the underworld. On the picture above, Yama is not visible. It immediately suggests itself to associate this rope from mythology with the silver cord. A detailed explanation concerning the ‘rope-trick’ by Mircea Eliade, from the book "Schamanismus und archaische Ekstasetechnik" (german edition), Rascher Verl., Zürich, page 402 – 405. The rope trick has a long history in India and is associated with two shamanic rituals, namely the ‘dismemberment initiation’ of the future shaman by ‘demons’ and the following ascension. We remember the ‘initiation dreams’ of the Siberian shamans, in which the aspirant experiences the dismemberment of his own body by the souls of the ancestors or by evil spirits. After this, his bones are collected, soldered with iron, the flesh is renewed and the future shaman has a ‘new body’ when he is resurrected. This body allows him to get stabbed with knives and sabres, to touch red-hot metal etc. without getting hurt. Remarkably, the Indian fakirs are said to perform the same miraculous deeds. In the ‘rope trick’, they kind of perform the same ‘dismemberment initiation’ which the Siberian shamans are enduring in a dream. By the way, the rope trick – though having become a speciality of fakirism – is also known in countries far away like China, Java, the old Mexico and the medieval Europe. In Europe, many texts mention – latest from the 13th century on – the same miracles in witches and wizards, that also have the ability to fly and to become invisible – in the same way as shamans and yogis. […] With the help of a rope or a ladder (as well as a vine, a bridge, a chain of arrows etc. ), the gods descend to the earth and the humans (shamans) ascend to heaven. In old myths very often the three Norns are mentioned - Urd, Werdandi und Skuld, spinning the cord of life, measuring it and cutting it.